This document outlines the process for contributing code to the Astropy project. Already experienced with git? Contributed before? Jump right to Astropy Guidelines for git. a local copy of the astropy source. Instructions for doing that, including the basics you need for setting up git and GitHub, are at Try the development version. You cannot easily work on the development version of astropy in a python environment in which you also use the stable version. It can be done — but can only be done successfully if you always remember whether the development version or stable version is the active one. Python virtual environments offer a better solution and take only a few minutes to set up. It is well worth your time. Not sure what your first contribution should be? Take a look at the Astropy issue list and grab one labeled “package-novice”. These issues are the most accessible ones if you are not familiar with the Astropy source code. Issues labeled as “effort-low” are expected to take a few hours (at most) to address, while the “effort-medium” ones may take a few days. The developers are friendly and want you to help, so don’t be shy about asking questions on the astropy-dev mailing list. Git Basics, part of a much longer git book. In practice, you need only a handful of git commands to make contributions to Astropy. There is a more extensive list of Git resources if you want more background. Before going further, make sure you have set up astropy as described in Try the development version. If that works, also run git fetch --all. If it runs without errors then your installation is working and you have a complete list of all branches in your clone, your-github-username and astropy. The naming scheme used by git will also be used here. A plain branch name, like master means a branch in your local copy of Astropy. A branch on a remote, like astropy , is labeled by that remote, astropy/master. This duplication of names can get very confusing for maintainers when trying to merge code contributions into the official master branch, astropy/master. As a result, you should never do any work in your master branch, master. Always work on a branch instead. git fetch gets the latest development version of Astropy, which you will use as the basis for making your changes. 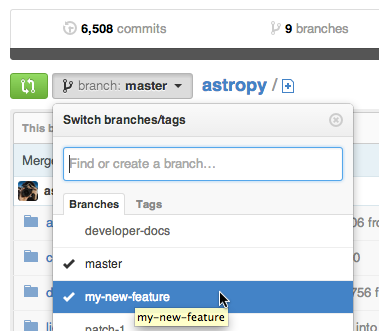 git branch makes a logically separate copy of Astropy to keep track of your changes. git add stages files you have changed or created for addition to git. git commit adds your staged changes to the repository. git status to see a list of files that have been modified or created. A good graphical interface to git makes some of these steps much easier. Some options are described in Get a git GUI (optional). git provides a number of ways to recover from errors. If you end up making a git mistake, do not hesitate to ask for help. An additional resource that walks you through recovering from git mistakes is the git choose-your-own-adventure. Don’t use your master branch for anything. Consider Deleting your master branch. Make a new branch, called a feature branch, for each separable set of changes: “one task, one branch” (ipython git workflow). Start that new feature branch from the most current development version of astropy (instructions are below). Name your branch for the purpose of the changes, for example bugfix-for-issue-14 or refactor-database-code. Make frequent commits, and always include a commit message. Each commit should represent one logical set of changes. Ask on the astropy-dev mailing list if you get stuck. Never merge changes from astropy/master into your feature branch. If changes in the development version require changes to our code you can Rebase, but only if asked. Change the name of the remote origin to your-github-username. Name the remote that is the primary Astropy repository astropy; in prior versions of this documentation it was referred to as upstream. Make a new feature branch; you will make your changes on this branch. Follow The editing workflow to write/edit/document/test code - make frequent, small commits. From GitHub, Ask for your changes to be reviewed to let the Astropy maintainers know you have contributions to review. Revise and push as necessary in response to comments on the pull request. Pushing those changes to GitHub automatically updates the pull request. A worked example that follows these steps for fixing an Astropy issue is at Contributing code to Astropy, a worked example. Some additional topics related to git are in Some other things you might want to do. This will pull down any commits you don’t have, and set the remote branches to point to the latest commit. For example, ‘trunk’ is the branch referred to by astropy/master, and if there have been commits since you last checked, astropy/master will change after you do the fetch. Making a new branch for each set of related changes will make it easier for someone reviewing your branch to see what you are doing. Choose an informative name for the branch to remind yourself and the rest of us what the changes in the branch are for. Branch names like add-ability-to-fly or buxfix-for-issue-42 clearly describe the purpose of the branch. At this point you have made and checked out a new branch, but git does not know it should be connected to your fork on GitHub. You need that connection for your proposed changes to be managed by the Astropy maintainers on GitHub. From now on git will know that my-new-feature is related to the your-github-username/my-new-feature branch in your GitHub fork of Astropy. You will still need to git push your changes to GitHub periodically. The setup in this section will make that easier. Ideally you should set up a python virtual environment just for this fix; instructions for doing to are at Python virtual environments. Doing so ensures you will not corrupt your main astropy install and makes it very easy to recover from mistakes. Make changes to one or more files and/or add a new file. Check that your changes do not break existing code. Add documentation to your code and, as appropriate, to the Astropy documentation. Ideally, also make sure your changes do not break the documentation. Add tests of the code you contribute. Make some changes to one or more files. You should follow the Astropy Coding Guidelines. Each logical set of changes should be treated as one commit. For example, if you are fixing a known bug in Astropy and notice a different bug while implementing your fix, implement the fix to that new bug as a different set of changes. For more details on running tests, please see Testing Guidelines. Make sure your code includes appropriate docstrings, described at Astropy Docstring Rules. If appropriate, as when you are adding a new feature, you should update the appropriate documentation in the docs directory; a detailed description is in Writing Documentation. If the build_docs command is not found, try running python setup.py build_sphinx instead. Add tests of your new code, if appropriate. Some changes (e.g. to documentation) do not need tests. Detailed instructions are at Testing Guidelines, but if you have no experience writing tests or with the py.test testing framework submit your changes without adding tests, but mention in the pull request that you have not written tests. An example of writing a test is in Contributing code to Astropy, a worked example. Stage your changes using git add and commit them using git commit. An example of doing that, based on the fix for an actual Astropy issue, is at Contributing code to Astropy, a worked example. Make your git commit messages short and descriptive. If a commit fixes an issue, include, on the second or later line of the commit message, the issue number in the commit message, like this: Closes #123. Doing so will automatically close the issue when the pull request is accepted. Some modifications require more than one commit; if in doubt, break your changes into a few, smaller, commits rather than one large commit that does many things at once. Repeat the steps above as necessary! If you are opening a new pull request, you may not know its number yet, but you can add it after you make the pull request. If you’re not sure where to put the changelog entry, wait at least until a maintainer has reviewed your PR and assigned it to a milestone. When writing changelog entries, do not attempt to make API reference links by using single-backticks. This is because the changelog (in its current format) runs for the history of the project, and API references you make today may not be valid in a future version of Astropy. However, use of double-backticks for monospace rendering of module/class/function/argument names and the like is encouraged. A pull request on GitHub is a request to merge the changes you have made into another repository. Go to the URL of your fork of Astropy, e.g., https://github.com/your-user-name/astropy. Enter a title for the set of changes, and some explanation of what you’ve done. If there is anything you’d like particular attention for, like a complicated change or some code you are not happy with, add the details here. If you don’t think your request is ready to be merged, just say so in your pull request message. This is still a good way to start a preliminary code review. You may be asked to make changes in the discussion of the pull request. Make those changes in your local copy, commit them to your local repo and push them to GitHub. GitHub will automatically update your pull request. Sometimes the maintainers of Astropy may ask a pull request to be rebased or squashed in the process of reviewing a pull request for merging into the main Astropy master repository. The decisions of when to request a squash or rebase are left to individual maintainers. These may be requested to reduce the number of visible commits saved in the repository history, or because of code changes in Astropy in the meantime. A rebase may be necessary to allow the Continuous Integration tests to run. Both involve rewriting the git history, meaning that commit hashes will change, which is why you should do it only if asked. Conceptually, rebasing means taking your changes and applying them to the latest version of the development branch of the official Astropy as though that was the version you had originally branched from. Each individual commit remains visible, but with new metadata/commit hashes. Squashing commits changes the metadata/commit hash, and also removes separate visibility of individual commits; a new commit and commit message will only contain a textual list of the earlier commits. After altering the history, e.g. with git rebase, a normal git push is prevented, and a git push --force will be required. Behind the scenes, git is deleting the changes and branch you made, making the changes others made to the development branch of Astropy, then re-making your branch from the development branch and applying your changes to your branch. You are more likely to run into conflicts here–places where the changes you made conflict with changes that someone else made–than anywhere else. Ask for help if you need it. Typically we ask to squash when there was a fair amount of trial and error, but the final patch remains quite small, or when files were added and removed (especially binary files or files that should not remain in the repository) or if the number of commits in the history is disproportionate compared to the work being carried out (for example 30 commits gradually refining a final 10-line change). Conceptually this is equivalent to exporting the final diff from a feature branch, then starting a new branch and applying only that patch. The last command will open an editor with all your commits, allowing you to squash several commits together, rename them, etc. Helpfully, the file you are editing has the instructions on what to do. If you run into any problems, do not hesitate to ask. A more detailed conceptual discussing of rebasing is at Rebasing on trunk.